The café barista hasn’t quite reached the status of the wine sommelier in France, but the French are finally starting to come around to specialty coffee. It may surprise many that France, with its propensity toward fine foods, has lagged behind its European counterparts on the specialty coffee roaster scene. The French press was the most common way to prepare coffee in France (at home) until the beginning of this century. Shown here with our french press insulated cover, the Koffee Kozee™, which keeps coffee hot in the press for up to an hour. But with the opening in 1994 of the first branded chain in France, homegrown Columbus Café, a different kind of coffee experience began. The store now boasts more than 100 shops countrywide.Chief Executive Officer of Columbus Café Nicolas Riché says that, at that time, stylishly appointed cafés and coffee-to-go were foreign concepts in the French market. Branded chains have slowly given way to smaller specialty coffee shops cropping up in not just Paris but all over the country. One of the leaders of French specialty coffee outside of the capital has been Café Mokxa, a roaster based in France’s food capital, Lyon. Opened in 2011 by Sadry-Alexandre Abidi and Rosamund Morris James, the two founders originally met in New Zealand (where James is from). “I was working for a small coffee roaster as a barista in my hometown and Sadry worked at the local delicatessen. He would come down for a coffee on his lunch breaks and I still remember his face when he said ‘actually, you don’t need to put sugar in this coffee!’ It was the first time I realized there was such a cultural divide between New Zealand coffee culture and French coffee culture,” says James. But thanks to the work of these and other coffee entrepreneurs, the taste for coffee in France is shifting, and the expansion of specialty coffee in France shows that the French are in fact willing to change. And, of course, enter Starbucks. In most countries outside the U.S., it seems when Starbucks arrives on the scene, the scene has also arrived. But France has proved to be a formidable challenger, with its deep-seated smoky, moody café traditions, so when Starbucks arrived in 2005, growth was slow in some places. In fact, whereas Starbucks has taken off in most Asian countries, it’s had a smaller presence in Europe, and has only about 110 outlets in France. 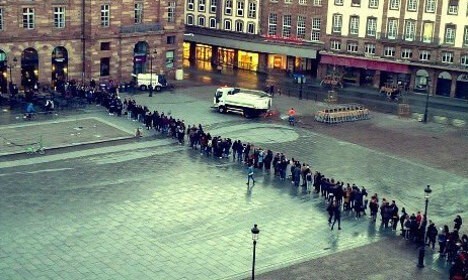 But it’s gaining popularity, as evidenced by this photo taken in Strasbourg, with an enormous line of people waiting for the local Starbucks’ grand opening in 2016. The monster chain began plans to expand in 2015, when it announced a partnership with Casino Restauration to open Starbucks stores within Géant Casino Hypermarkets and Casino Supermarkets in France. Full-format Starbucks opened within Groupe Casino's grocery sites, allowing customers to enjoy its products while they shop. We’ll keep an eye on this development to see if this is the niche Starbucks needed to get more of a stronghold in France. Join us for our next blog in this series when we cover the best coffee shops in the beating pulse of France: gay “Pah-ree!” Know a thing or two about coffee in France? Drop us a comment below.